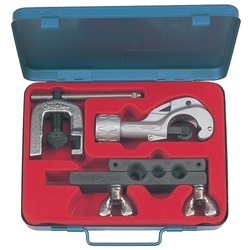 SUPER TUBING TOOL SET TSC-420MComes with TC-105 tube cutter. (4, 5, 6, 8, 10, 12, 14, 16, 20) mm. Comes with TC-105 tube cutter. (4, 5, 6, 8, 10, 12, 14, 16, 20) mm.